The First World War had been a long time in the making. The treaty alliance system had turned Europe into a tinder box waiting to be lit. Many people believe that the assassination of Archduke Franz Ferdinand, heir to the Austro-Hungarian throne, in Sarajevo on 28 June 1914 by a Serbian Nationalist secret society known as the Black Hand was effectively the cause of the ‘Great War’ and although this was the spark that lit the flame that ignited Europe and ultimately culminated in the world’s first global war, it was not the sole reason. This war had been a long time in the making and we should go back to 1862 to begin to look at the real reasons for the conflict because prior to this date there really was no Germany. In 1862 the Prussian Kaiser Wilhelm I (picture left) appointed Otto von Bismarck (pictured below right) as his Chancellor and Foreign Minister. Bismarck was at heart an empire builder and he set about creating the German Empire by collecting together a number of smaller German speaking states by the means of high politics and war, mainly again Austria and France. His first step was to oust Austria as the main influence among these small German states. In 1866 he achieved this by engineering a war with Austria over disputed territory in the duchy of Holstein. This resulting war lasted only seven weeks due to the complete dominance of the Prussian military and became known as ‘The Seven Weeks War’. A peace was mediated by the French Emperor, Napoleon III (pictured below right)and Bismarck extracted from Austria, not only Schleswig and Holstein, but also Hanover, Hesse, Nassau and Frankfurt thus creating the North German Federation. Also, Bismarck had successfully displaced Austria as the main spheres of influence over the many small German states. Having assembled a federation in the north, Bismarck now looked to achieve the same in the south and unite all of the German states under the Prussian banner. He also wanted to include two German speaking provinces of France; Alsace and Lorraine. How could Bismarck achieve this? Upon weighing up the situation he resolved that a war with France, a common enemy of Germany, would attain this. But he would need a credible reason to go to war with France. The reason presented itself in 1870 when Bismarck attempted to place a Hohenzollern Prince on the vacant throne in Spain. 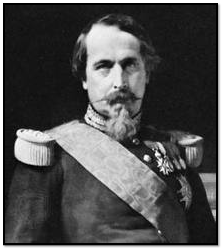 Napoleon III, fearful of the prospect of theoretical war on two fronts with Prussia on one front and Spain on the other as the Hohenzollern Prince was a relative of Kaiser Wilhelm I. Napoleon III objected strongly. Bismarck began to fan the flames by releasing, on 14 July 1870, an altered version of a telegram ostensibly from the Kaiser to Bismarck himself, known as the Ems Despatch. The effect was to simultaneously insult both France and Prussia over their inability to resolve the dispute over the Spanish throne. Napoleon III, facing civil revolt at home over quite unrelated matters, and receiving encouraging noises from his military commanders, responded by declaring war against Prussia five days later, on 19 July 1870. Once again the Prussian military machine crushed the opposition. The French forces that were personally led by Napoleon III lost Battle of Sedan, surrendered and was deposed in a civil war that in France that resulted in the Third French Republic. In the meantime the Prussian forces laid siege to Paris between September 1870 and January 1871 and starved the city into surrender. With this war at an end the consequences were numerous. Aside from the usual territorial gains, France handed over both Alsace and Lorraine to the Prussians and was forced to pay staggering reparations equivalent to around $1 billion today. The southern German states agreed to an alliance with their northern counterparts, resulting in the creation of Bismarck’s cherished German Empire and Kaiser Wilhelm I was crowned the Emperor in the Hall of Mirrors at Versailles. The creation of a unified Germany was of direct relevance to the outbreak of war some 43 years later as it resulted in the assembly of the key alliances that would later come into play. 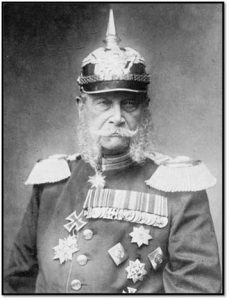 Now Bismarck’s expansionary plans were at an end, he had secured what he wanted, and his chief desire now was to maintain its stability. He therefore set about building European alliances aimed at protecting Germany from potentially threatening quarters. He was all too aware that France was looking to avenge their defeat and to reclaim the lost provinces of Alsace and Lorraine at the earliest opportunity. In fact the French plan for war in 1914, Plan XVII was based around the recapture of these provinces in the shortest possible time. 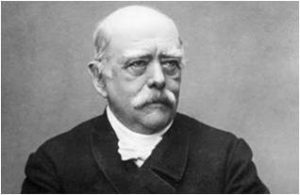 Bismarck felt no reason to fear an alliance between France and Britain, for the latter of the two was at that time in the midst of a self-declared 1870’s policy of “splendid isolation” and chose to stay above continental European politics. If Bismark could not form an alliance with Britain then perhaps he could with Russia and quite possibly his once beaten neighbour, Austria-Hungary. Negotiations began in 1873 and the Three Emperors’ League was formed. This tied Germany, Austria-Hungary and Russia to each other’s aid in time of war. This however only lasted until Russia’s withdrawal five years later in 1878, leaving Bismarck with a new Dual Alliance with Austria-Hungary in 1879. In the Dual Alliance treaty, Germany and Austria promised aid to each other in the event of an attack by Russia, or if Russia aided another power at war with either Germany or Austria-Hungary. Should either nation be attacked by another power, e.g. France, they were to remain at the very least benevolently neutral. This alliance, endured until war in 1914 and it was this clause that Austria-Hungary invoked in calling Germany to her aid against Russia’s support for Serbia who were in turn protected by a treaty with Russia. Two years after Germany and Austria-Hungary had concluded their Dual Alliance Treaty, Italy was brought into the fold with the signing of the Triple Alliance in 1881. Under the provisions of this treaty, Germany and Austria-Hungary promised to assist Italy if she were attacked by France, and vice versa: Italy was bound to lend aid to Germany or Austria-Hungary if France declared war against either. Also, should any of the three find themselves at war with two powers or more, the other two would provide military assistance. Finally, should any of the three decide to launch a ‘preventative’ war the others would remain neutral. One of the chief aims of the Triple Alliance was to prevent Italy from declaring war against Austria-Hungary whom the Italians were in dispute with over territorial matters. The Triple Alliance was essentially meaningless! Italy had secretly negotiated a treaty with France, under which Italy would remain neutral should Germany attack France. This would transpire when the alliances began to fall in 1914 and war loomed. Italy declared that Germany’s war against France was an ‘aggressive’ one and so this entitled Italy to claim neutrality. A year later, in 1915, Italy did enter the First World War but as an ally of Britain, France and Russia. In 1883 Austria-Hungary signed an alliance with Romania that was negotiated by Germany, although in the event Romania – after starting World War One as a neutral – eventually joined in with the Allies; as such Austria-Hungary’s treaty with Romania was of no actual significance. The Reinsurance Treaty was of greater importance but was allowed to lapse three years after its creation. Bismarck, in 1887, agreed to a so-called Reinsurance Treaty with Russia. This treaty stated that both powers would remain neutral if either were involved in a war with a third. However, if the third power was France, Russia would not be obliged to provide assistance to Germany, as was the case of Germany if Russia found itself at war with Austria-Hungary. Bismarck’s sole intention was to avoid the possibility of a two-front war against both France and Russia. The Russian Tsar, Nicholas II, allowed the Reinsurance Treaty to lapse in 1890. This was the same year the new German Kaiser, Wilhelm II, brought about the dismissal of his veteran Chancellor, Bismarck. One year after the Reinsurance Treaty lapsed Russia allied itself with France. Both powers agreed to consult with the other should either find itself at war with any other nation or if the stability of Europe was threatened. This rather loosely worded agreement was solidified in 1892 with the Franco-Russian Military Convention, aimed specifically at counteracting the potential threat posed by the Triple Alliance of Germany, Austria-Hungary and Italy. To put it in the shortest possible terms, should France or Russia be attacked by one of the members of the Triple Alliance or even if one should mobilise against them, then the other power would provide military assistance. Britain was now becoming aware of Germany emerging as a great European power with colonial aspirations. Kaiser Wilhelm’s successor, Wilhelm II (pictured right), proved far more ambitious in establishing “a place in the sun” for Germany. With the effective dismissal of Bismarck, the new Kaiser was determined to establish Germany as a great colonial power in the pacific and, most notably, in Africa. Wilhelm, encouraged by naval minister Tirpitz, embarked upon a massive shipbuilding exercise intended to produce a naval fleet the equal of Britain’s, unarguably by far and away the world’s largest. Britain, at that time the greatest power of all, took note. In the early years of the twentieth century, in 1902, she agreed a military alliance with Japan, aimed squarely at limiting German colonial gains in the east. She also responded by building-up in her own naval strength. By the time war was declared in 1914, Germany could muster 29 battleships, Britain 49. Despite her success in the naval race, Germany’s ambitions succeeded at the very least in pulling Britain into the European alliance system – and, it has been argued, brought war that much closer. In 1904, Britain signed the Entente Cordiale with France. This agreement finally resolved numerous leftover colonial squabbles although it did not commit either country to the other’s military aid in time of war, it did however offer closer diplomatic co-operation generally. In 1907, Russia formed the Triple Entente which was to last until World War One. She also signed an agreement with Britain, the Anglo-Russian Entente. These two agreements formed the three-fold alliance that lasted, and effectively bound each to the other, right up till the outbreak of world war just seven years later. Although the two agreements were not militarily binding in any way, a “moral obligation” was placed on each side to aid the other in time of war. It was this moral obligation that drew Britain into war in order to defend France, although the British pretext was actually the terms of the 1839 Treaty of London that committed the British to defend Belgian neutrality. However in 1912 Britain and France did conclude a military agreement, the Anglo-French Naval Convention, which promised British protection of France’s coastline from German naval attack, and French defence of the Suez Canal. Such were the alliances between the major continental players. There were other, smaller alliances too – such as Russia’s pledge to protect Serbia, and Britain’s agreement to defend Belgian neutrality – and each served its part in drawing each nation into the coming Great War. In the interim between the formation of these treaties and alliances there were a number of small conflicts that helped to stir emotions leading up to 1914. These ‘minor wars’ gave certain nations more stake than others in entering the world war. Trouble had been looming since 1903 when Russia declined Japan’s offer for each of them to recognise the other’s interests in Manchuria and Korea. The Japanese launched a successful attack upon Russian warships in Korea, at Inchon and Port Arthur, China. This was followed by a land invasion of both disputed territories of Korea and Manchuria in 1904. The Japanese went on to astonish the western powers by destroying the entire Russian fleet at the Battle of Tsushima (27-28 May 1905) for the loss of two torpedo boats. U.S. President, Theodore Roosevelt, mediated a peace agreement between Japan and Russia, one that resulted in material gains for Japan and with note being taken in Berlin of the fallacy of the myth of Russian “invincibility”. Russia’s humiliating defeat contributed to the attempted Russian Revolution of 1905. The shaken Tsar, Nicholas II, was determined to restore Russian prestige and what better way to achieve this than through military conquest? Trouble in the Balkans was not a new event. In 1912 it continued with war between Italy and Turkey, over the latter’s African possessions. Turkey lost and was forced to hand over Libya, Rhodes and the Dodecanese Islands to the Italians. This did not end Turkey’s troubles. Having concluded peace with the Italians it found itself engulfed in war with no fewer than four small nations over the possession of Balkan territories: Greece, Serbia and Bulgaria and later Montenegro. The intervention of the larger European powers brought about an end to this, the First Balkan War of 1912-13, and again Turkey lost out, shedding Crete and all of its European possessions. Later in 1913, conflict erupted again in the Balkans (Second Balkans War). Bulgaria was unsatisfied with its earlier spoils and fought with its recent allies in an attempt to control a greater part of Macedonia; and when the so-named “Young Turks” (Turkish army officers) denounced the earlier peace as unfair. Between May and July 1913, Bulgaria’s former allies beat back the new aggressor, Bulgaria, and Romania captured the Bulgarian capital Sofia in August. Beaten and having surrendered on 10 August 1913, Bulgaria lost Adrianople back to Turkey. Despite a new peace in the Balkans, nothing had settled and tensions remained high. Several small nations that had found themselves under Turkish or Austro-Hungarian rule stirred themselves in nationalistic fervour. Yet while these Balkan nations searched for their own individual voice and self-determination, they were nevertheless united in identifying themselves as pan-Slavic peoples, with Russia as their chief ally. The latter was keen to encourage this belief in the Russian people as the Slav’s natural protectors, for aside from an emotional attachment, it was a means by which Russia could regain a degree of lost prestige. In 1914, trouble was not restricted to these smaller nations. Trouble in the Balkans directly impacted on the Austro-Hungarian and the ageing Emperor Franz Josef, was struggling to maintain coherence of the various diametrically opposed ethnic groups which fell under the Austro-Hungarian umbrella. As such, the assassination of Franz Ferdinand by the Serbian nationalist secret society, the Black Hand, provided the Austro-Hungarian government with a great opportunity to stamp its authority over the region. Russia, the ally of the Slavs and therefore of Serbia, was struggling to hold back full-scale revolution ever since the Japanese military disaster of 1905. In 1914 the Russian government saw war with Austria-Hungary as an opportunity to restore social order which it indeed did, or at least until the continuation of repeated Russian military setbacks. Rasputin’s intrigue at court, as well as the food shortages. combined to bring about the long threatened total revolution. This was encouraged by Germany and brought about Russia’s withdrawal from the war in 1917. Almost immediately following her defeat by Prussia in the Franco-Prussian War of 1870-71, together with the humiliating annexation by the newly unified Germany of the coal-rich territories of Alsace and Lorraine, the French government and military were united in thirst for revenge. They had devised a strategy for a vengeful war upon Germany, Plan XVII. The chief aim was the defeat Germany and to restore the provinces of Alsace and Lorraine to French rule. This plan was fatally flawed as it relied totally upon the “élan”, an irresistible force that would sweep over its enemies. Germany was unsettled socially and militarily. The 1912 Reichstag elections had resulted in the election of no fewer than 110 socialist deputies, making Chancellor Bethmann-Hollweg’s task in liaising between the Reichstag and the autocratic Wilhelm, not to mention the rigidly right-wing military high command, almost impossible. Bethmann-Hollweg (pictured right) came to believe that Germany’s only hope of avoiding civil unrest lay in war sooner rather than later. 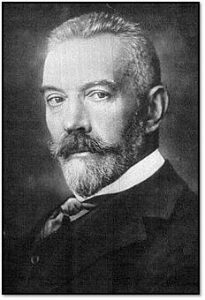 Bethmann-Hollweg’s outlook fuelled his decision of 6 July 1914 to offer the Austro-Hungarian government “a blank cheque” which was an unconditional guarantee of support for no matter what she decided. Kaiser Wilhelm II was finding himself largely frustrated in his desire to carve out a grand imperial role for Germany. Whilst he desired “a place in the sun” he found that all of the bright areas had been snapped up by the other colonial powers. 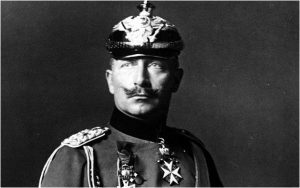 Not that Wilhelm II was keen upon a grand war as he failed to foresee the consequences of his military posturing. His determination to construct land and naval forces to equal those of Britain and France had met with varying success. However his government and his military commanders anticipated what was to come and a plan to take on both Russia and France in a war on two fronts, had long been expected and taken into account. 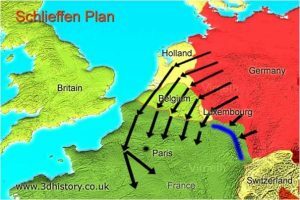 This plan which had been devised by former Army Chief of Staff Alfred von Schlieffen, had been crafted to deal with a two-front war scenario. The plan, which very nearly succeeded, was to conquer France and to knock her out of the war, on a ‘Western Front’ within five weeks while the Russians were still mobilising (Germans estimated it would take six weeks for the Russians to fully mobilise). They would then turn their army eastwards and move it to the ‘Eastern Front’ via their extensive rail network. They would then effectively engage and destroy the Russian forces. It is speculated that the plan would have succeeded but for the decision of the then German Chief of Staff in 1914, Helmuth von Moltke, to authorise a critical deviation from the plan that is believed to have stemmed from a lack of nerve. This crucially slowed the path towards Paris with fatal consequences and which ended in static trench warfare. However, the German plan did not take into account Britain’s entry into the war and gave no credence to the possibility that Britain would ignore her own commercial interests and would instead uphold her ancient treaty of obligation to recover violated Belgian neutrality. It is possible that Germany would have backed away from war had Britain declared her intentions sooner. Believing Britain would stay out of any coming conflict and just limit herself to diplomatic protests because she had no military obligation to aid France. And so, Germany and Austria-Hungary proceeded under the belief that war would be fought solely with France and Russia. The British Government, and its Foreign Minister, Sir Edward Grey, attempted to mediate throughout July, reserving at all times its right to remain aloof from the dispute. It was only as the war began that the British position solidified into support ostensibly for Belgium. Hence had Britain come out clearly on the side of Belgium and France earlier in July, war could possibly have been avoided. Germany would have effectively instructed Austria-Hungary to settle with Serbia especially given the latter’s willingness to co-operate with Austria-Hungary. Whether this would have transpired given the German war machine’s determination for war is of course unknown. 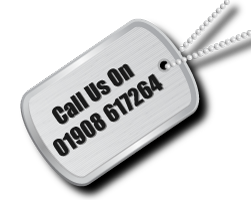 The First World War has sometimes been labelled “a family affair”. This is derived from the reality that many of the European monarchies of which many fell during the war (including those of Russia, Germany and Austria-Hungary) were inter-related. The British monarch George V’s predecessor, Edward VII, was the German Kaiser’s uncle and, via his wife’s sister, uncle of the Russian Tsar as well. His niece, Alexandra, was the Tsar’s wife. Edward’s daughter, Maud, was the Norwegian Queen, and his niece, Ena, Queen of Spain; Marie, a further niece, was to become Queen of Romania. Despite these familial relations, nine Kings attended Edward’s funeral. European politics was all about power and influence, of protection and encirclement. Thus a tangled web of alliances which sprung up in the wake of the rise of the newly united German Empire in 1871. And so, Austria-Hungary’s reaction to the assassination of their heir on 28 June 1914 took three weeks in coming. This could be because Franz Ferdinand (pictured left) was not loved by the Emperor Franz Josef or his government. Whether or not the Serbian government was connected with the assassination, and for that matter with the Black Hand (this has always remained unclear), the Austria-Hungarians argued that it was and decided that they would stamp out any nationalist movement and impose its authority on the Serbians and the Balkan region in general. An ultimatum was issued to the Serbian government which in its extent demanded that the assassins be brought to justice and that Serbia’s sovereignty be nullified. 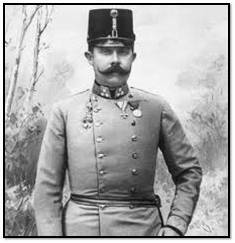 By issuing such strong demands, they expected that the Serbians would reject the terms out of hand and thus give Austro-Hungarians the pretext to launch a limited war against Serbia. Serbia had long had Slavic ties with Russia, and whilst not really expecting that Russia would be drawn into this dispute other than through diplomatic protest, the Austro-Hungarian government sought assurances from her main ally, Germany, that if the unthinkable happened, and Russia declare war on her, then Germany would come to her aid. Germany readily agreed to this and even encouraged Austro-Hungarian’s warlike manner. The events that now take place lead to the ‘Great War’. Austria-Hungary, on 28 July 1914, not satisfied with Serbia’s response to her ultimatum which was almost entirely agreed to other than a few minor points, declared war on Serbia. Russia, who was bound by treaty to Serbia, began to mobilisation her vast army in her defence. This was a very slow process that would take six weeks to complete. Germany, who by a treaty was allied to Austria-Hungary, looked at the Russian mobilisation as an act of war against Austria-Hungary. On 1 August, after several warnings, she declared war on Russia but not before warning France to stay out of what it considered to be a ‘regional affair’. France, bound by treaty to Russia, found itself at war with Germany and also by extension, with Austria-Hungary following a German declaration on 3 August. Germany quickly invaded neutral Belgium in order to reach Paris by the shortest route. Britain was allied to France by a loosely worded treaty which obligated her to come to her defence. She was also obligated to defend neutral Belgium by the terms of the 75-year old Treaty of London. When the Germans invaded Belgium on 4 August the Belgium King called on Britain for assistance. Britain stated that it would declare war on Germany if she did not withdraw from Belgium territory by 11:00pm that evening. No such undertaking was forthcoming from the Germans and as Big Ben struck 11:00 Britain found itself at war. Like France, she was now by extension also at war with Austria-Hungary. Upon her entry into the war, her colonies and dominions abroad which included Australia, Canada, India, New Zealand and the Union of South Africa offered military and financial assistance. The United States President Woodrow Wilson declared a U.S. policy of absolute neutrality, a stance that would last until 1917 when Germany’s policy of unrestricted submarine warfare threatened America’s commercial shipping forcing the U.S. to finally enter the war on 6 April 1917. Japan, honouring a military agreement with Britain, declared war on Germany on 23 August 1914. Two days later Austria-Hungary responded by declaring war on Japan. Italy, although allied to both Germany and Austria-Hungary avoided entering the war via a clause enabling it to evade its obligations to both. Basically Italy was committed to only defend Germany and Austria-Hungary in the event of a ‘defensive’ war; arguing that their actions were ‘offensive’ she declared instead a policy of neutrality. The following year, in May 1915, she finally joined the conflict and sided with the Allies against her two former allies. What is clear is that the alliance system was very much at fault for bringing about the scale of this conflict. What initially began as a small regional conflict, to use the German phrase, rapidly escalated out of hand and engulfed the world in its first Great War.